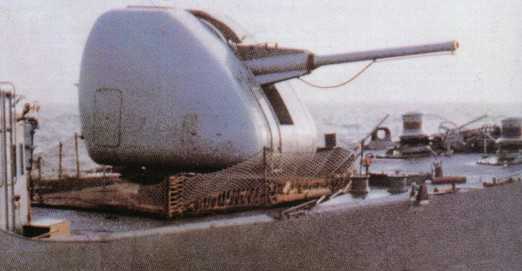 An export-only weapon used in the Portuguese, Saudi Arabian, Malaysian and People's Republic of China Navies, this is a lighter mounting than the previous 100 mm (3.9") Model 1968. The Compact can fire preset bursts of 1, 2, 3 or 6 rounds. When changing shell types, the unused shells are automatically rerouted back into the magazine. Fully automatic and the mounting itself is unmanned. The Mark 2 version has a very short reaction time, only ten seconds from "power on" to the first shot and a slightly faster rate of elevation. This version was designed for better operability and increased reliability. It has been reported that the People's Republic of China uses designs copied from this weapon. ^Illumination round burns between 30 and 50 seconds at 120,000 candela. ^Most Mark 1 mountings have a 42-round ready magazine, but those sold to Malaysia had 90-round ready magazines. In addition, 18 rounds are carried in an intermediate magazine next to the gun itself. The Mark 2 mounting stores 66 ready-use rounds in its basic version, 42 of one type and 12 each of two other types. The expanded version of the Mark 2 can store up to 114 ready rounds, 90 of one type and 12 each of two other types. ^The Mark 2 gun mount can instantly select between three different kinds of ammunition. Ammunition feeds are are arranged such that rounds can be passed back down into the magazine when another shell type is selected. ^The weight given above is only for the gunhouse. Total weight including hoist and below-deck magazine is 18.7 tons (19 mt). 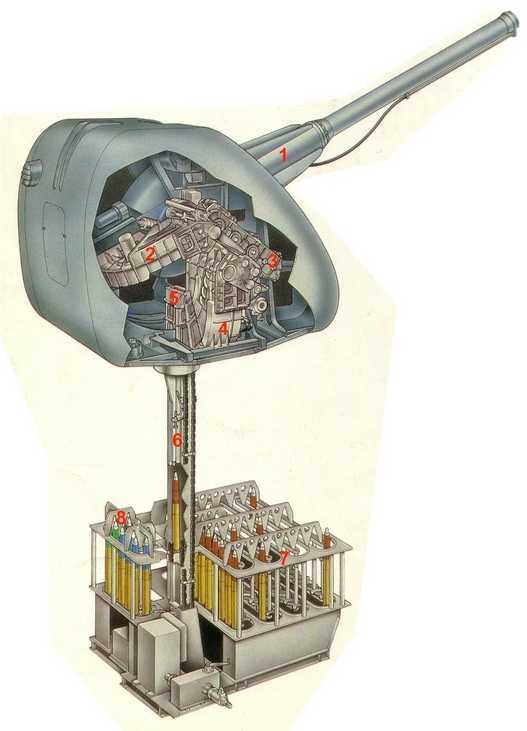 Cutaway of 100 mm Compact. Sketch copyrighted by GIAT. 1. Oscillating unit; 2. Mobile curved duct; 3. Intermediate magazine; 4. Fixed curved duct; 5. Introduction device; 6. Hoist; 7. Main automatic replenishment system (conventional ammunition); 8. Secondary automatic replenishment magazine (special ammunition).